High-flow carpet extraction is the best carpet cleaning method in the industry. It combines significant water recovery, high water flow, Dual-A-Mix pre-spray system, and portability. 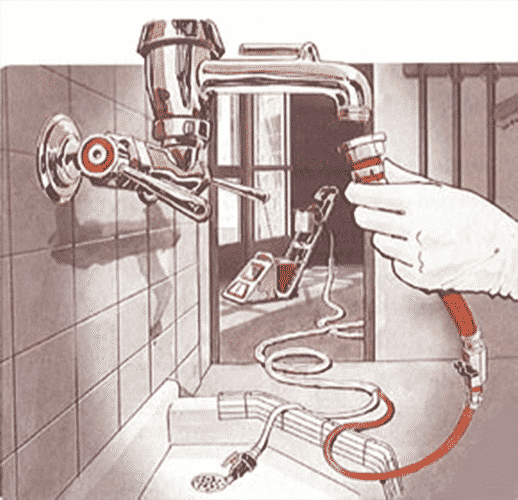 White hose indicates return of dirty water to drain at sink or toilet. The most unique quality of Steamin Demon Carpet Extractors is their ability to recover the cleaning water back out of the carpet while extracting. In fact, the Steamin Demon's water recovery rate is so high that drying times of an hour or less is not uncommon. The reason for this is simple, the vacuum motor is located within inches of the carpet. The short distance between the vacuum motor and the carpet allows Steamin Demon Extractors to channel much more vacuum force to the carpet. .Steamin Demon Extractors use 3-4 times the amount of cleaning water during the extraction process than other portable extractors. This gives Steamin Demon Extractors by far the highest water-flow rate ever used in a portable extractor. RESULT: When you use Steamin Demon Extractors, you greatly increase the quality of cleaning and the health of the indoor environment. A third unique quality of the Steamin Demon Carpet Extractors is its Automatic In-line Prespray System. Each machine comes with 33 ft. of prespray hose. This hose attaches to the machine on one end and has a Mix Applicator on the other end. To Prespray carpet all you have to do is aim and squeeze the Prespray Applicator. RESULT: Eliminates the Mixing of Chemicals and pump sprayers. A fourth quality of the Steamin Demon Carpet Extractors is their weight. The absence of large holding and recovery tanks make Steamin Demon much lighter than other walk behind extractors. This machine weighs between 31 to 36 lbs. which is one fourth the weight of the "other guys". RESULT: Lightweight, well-engineered designs provide excellent maneuverability, easy on the back and extremely user friendly. You've read about the high flow extraction process and the results. We believe these results are the mark of only the best carpet cleaning method in the industry today. Not convinced? Check out some of our portable carpet extractor videos.